Dark Circles are a common complaint for many of us. They make you look tired, dull and less confident. Due to stress, lack of sleep, environment toxins and many others, skin under the eyes get delicate and thin, and then the blood vessels get revealed giving off a dark discoloration under the eyes. Home remedies can be of a helping hand to improve the skin color under the eyes. Yet in order to get rid of dark circles permanently, one has to follow healthy lifestyle and sleep properly. Here are few tips to have a better sleep. When we talk about home remedies for dark circles, turmeric should be in the spotlight. Here are few reasons why tomato can be effective in reducing dark circles. Is Turmeric good for Dark Circles? The curcumin in turmeric reduces inflammation, redness, and swelling. When consumed internally, turmeric detoxifies the blood and liver, giving you radiant skin. It rejuvenates tired, sagging skin. Turmeric can be used alone and in combination with other natural ingredients that keep skin looking young and healthy. Use it to season your food and try the methods listed below until you find the one that works best for you. Lemon juice and tomato juice gently bleach skin while gram flour detoxifies it. In a blender, mix 1 teaspoon turmeric, ½ tomato, 1 tablespoon lemon juice, and 1 tablespoon gram flour until smooth. Apply on clean under-eye skin and leave on for 20 minutes or until dry. Orange Lentil flour detoxifies and softens skin. Mix 1 teaspoon each of turmeric, orange lentil flour, fresh lemon juice, and tomato puree. Apply on clean under-eye skin and leave on for 20 minutes. Pineapple juice contains vitamin C, antioxidants and bromelain which reduce fine lines, puffiness and wrinkles, while repairing sun damage and evening out skin tone. Mix 2 teaspoons of turmeric and 3 tablespoons of pineapple juice. Mint cools and soothes skin to reduce puffiness and sagging. In a blender, puree a handful of mint leaves and strain through cheesecloth to extract juice. Mix mint juice with ¼ teaspoon each of turmeric and gram flour. Apply to clean under-eye skin and leave on 20 minutes. Alternatively, apply crushed mint leaves on dark circles, rest them for 10 minutes and wipe it off with a damp cloth. The probiotics and lactic acid in buttermilk nourish skin while exfoliating to increase brightness and softness. Mix ¼ teaspoon turmeric with 2 teaspoons butter milk. Yogurt cools and soothes while balancing good and bad bacteria to prevent infections that cause breakouts. Mix ½ teaspoon turmeric, ½ teaspoon fresh lemon juice, and 2 tablespoons plain Greek yogurt until smooth. For added benefit, include ½ teaspoon raw honey or ½ teaspoon sandalwood powder. Mix ½ teaspoon turmeric with 2 tablespoons fresh lemon juice. Honey nourishes and moisturizes skin while helping to renew damaged skin cells. Milk provides proteins skin needs to stay healthy. Mix 1 teaspoon each of turmeric, raw honey, and milk to make a paste. The palmatic acid and retinol in Almond oil moisturize to prevent dark spots and wrinkles. Mix ¼ teaspoon turmeric with 1 teaspoon almond oil.. Mix 1 tablespoon of turmeric, 2 tablespoons of yogurt, 1 tablespoon lemon juice, 5 drops of tea tree oil and 3 tablespoons of almond oil. Apply this mixture and leave it for 15 minutes. Wash off with cool water and pat dry. You can even apply this as face mask. Almond butter moisturizes and rejuvenates skin. In a blender, mix 1 tablespoon whole milk, ¼ teaspoon turmeric powder, and 1 teaspoon smooth almond butter. Olive oil exfoliates and detoxifies skin while moisturizing and nourishing to prevent dryness and wrinkles. Mix ½ teaspoon turmeric with 1 tablespoon extra virgin olive oil until smooth. Fenugreek seeds are rich in potassium and proteins that help the body produce healthy new skin cells. Soak 2 tablespoons of fenugreek seeds in water for three hours. Mix fenugreek paste with ½ teaspoon turmeric and 2 tablespoons of raw milk until smooth. Melt ¼ cup coconut oil and stir in 2 tablespoons gram flour, 2 teaspoons turmeric, ½ teaspoon raw honey, and ½ teaspoon fresh lemon juice. Papaya gently and gradually lightens skin. Puree 1 cup papaya chunks in a blender. Add 1 tablespoon turmeric powder and blend until smooth. Refrigerate leftover mixture and repeat 3 times a week. This eye cream removes fine lines and lightens the skin. You can make this paste and refrigerate it for a week. Mix 2 tablespoons heavy cream with 1 teaspoon of turmeric. Milk helps the body adsorb the nutrients in turmeric to improve skin health from within. Twice a day, mix 2 tablespoons turmeric into a glass of milk and drink it. You can also take turmeric supplements if drinking turmeric milk is not an option for you to pursue. Mix 1 tablespoon raw honey, 3 tablespoons fresh-squeezed orange juice, and 1 tablespoon gram flour until smooth and pasty. Apply on clean under-eye skin and leave on for20 minutes. 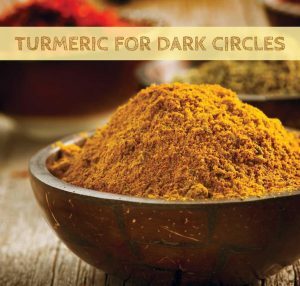 For best results, keep the following in mind when using turmeric to treat dark circles. Don’t get turmeric in your eyes. Before starting regular treatments, do a patch test to find out if you are allergic to turmeric. To get results, you have to use these treatments regularly for at least two weeks. Reduce stress through mediation and yoga. If these remedies make no difference, ask your doctor if your dark circles may indicate a more serious underlying health condition. Use sunscreen when going outside. Don’t cover dark circles with makeup. Have you tried using turmeric to diminish dark under-eye circles? Which methods worked best for you? Share your experience with us! I have sensitive skin and I’ve tried a lot of things to lighten my under eyes. But nothing so far has worked. I am a minor and I was wondering what you recommend for non leaving dark circles and bags. Please respond?? We recommend trying any one of the turmeric method mentioned above in the article. Turmeric is safe to apply even on the sensitive skin. I use tumeric in my diet… I have tried everything to remove the dark circles under my eyes but nothing worked…I’m skeptical about using tumeric under eyes…will it yellow my skin? Yes, it will leave a light hint of turmeric but is can be removed by massaging raw milk on it. Add lemon, gram flour and water. Make it as a paste and apply on face twice a week. It gives amazing effects on face. Removes blemishes and dark patches over face and neck. For dark circles apply tomato juice over eyelids and below the eyes before going to sleep. Keep it over night and wash it off the next morning. Continue this daily for 2 to 3 weeks. Dark circle gets removed for sure.